Friday July 21, 2017: We are starting to feel a tad bit guilty about the wonderful summer weather we’ve been having for the past five weeks when we hear from family and friends how damp and chilly it has been back home in Ontario. But five minutes later the feeling passes and we are ok again. We had a wonderfully quiet night at Willsboro Bay last night on the west side (New York) of Lake Champlain. 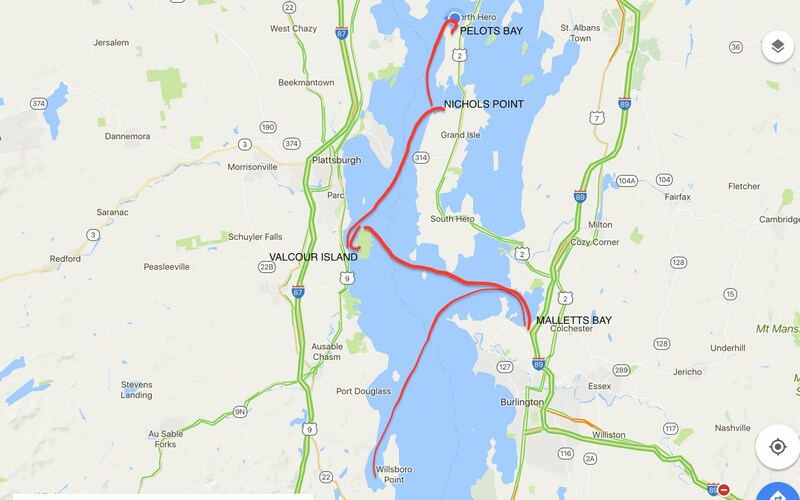 This morning, we are up and underway by 0900 hours to a very popular anchorage at Malletts Bay on the east side (Vermont) of Lake Champlain. It does seem odd to be moving back and forth between two States on your boat, day by day. Once we got out in open water, we were surprised to fine waves for the first time on Lake Champlain. It’s mostly been dead calm ever since we got on the Lake, but we’d heard it can get quite rough with little notice. Anyway, the waves were not too uncomfortable, hitting our stern at an angle and causing the boat to swirl back and forth from time to time. 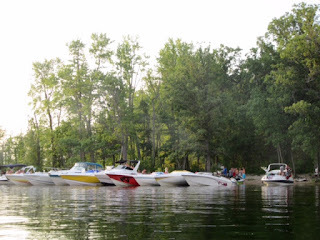 Malletts Bay is reportedly one of the most popular boating areas on Lake Champlain. It is actually two bays - a larger outer bay and a much smaller and more protected inner bay. Mallets Bay is separated from Lake Champlain by a long railroad causeway that is no longer used and the narrow entrance is at the location of an old swing bridge. The inner bay was our objective today and it offers numerous anchorages, depending on the wind direction. Here, the wind mostly blows either north or south, due to the mountain ranges on both sides of Lake Champlain. Today it was a strong south wind, so the protected anchorages were all on the south side of the inner bay. As we soon discovered, the south shore is also where all the marinas, cottages and mooring fields are located. So while it wasn’t hard to find a place to anchor, the scenery was not very appealing as you were virtually surrounded by marinas and boats on mooring balls. The more secluded and visually appealing anchorages were on the north shore with a strong south wind blowing into them. 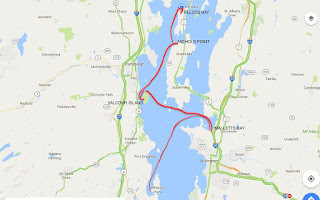 A short conference call with Bob and Jan (who were just leaving a marina in Burlington, Vermont) and we were off to our next choice of anchorage, Valcour Island, back on the New York side of Lake Champlain. With each passing day, we are seeing more and more Canadian boats and Quebec boats are dominating the scene. They outnumber New York and Vermont boats by a wide margin. Valcour Island has 1,000 acres of publicly owned forest, camping sites, 7 miles of hiking trails and five anchorages with good holding for anchoring and some even with beaches. During the Revolutionary War in the fall of 1776. Benedict Arnold took his fleet north on Lake Champlain to intercept the British Fleet under Guy Carleton, who was intending to attack the Americans at Ticonderoga. Benedict Arnold realized his fleet of 15 vessels faced a far superior British fleet, so Arnold positioned his fleet out of sight, along Valcour Island’s west shore, knowing the British would take the wider channel on the east side of the island. The British passed Valcour Island on September 23, 1776 with a north wind and after they passed, several American vessels left the anchorage to attack. The British fleet struggled to tack back into the north wind to engage the American fleet. A gun battle lasted late into the day, until the British fleet formed a blockade across the south end of the channel. Overnight, helped by darkness and fog, the American fleet slipped away and headed south for protection by Crown Point. The British pursued and a moving battle ensued until Benedict Arnold was forced to run most of his fleet ashore in Arnold Bay. The British finally reached Ticonderoga and were surprised to find the fort well protected with cannons and troops, so the British retreated to Quebec for the winter, setting the stage for a British defeat at Saratoga in 1777. We chose an anchorage on the north side of Valcour Island offering protection from the strong south wind. As then day went on, more and more boats arrived and the count was finally about 50 at dusk, with the bulk carrying either a Fleury-De-Lis, a Canadian Flag or both. Unfortunately, flag etiquette is not highly regarded by many of the boaters on Lake Champlain, with many flags being an inappropriate size and location on the boats. The water was pristine for swimming and certainly very refreshing to cool one down on this hot summer day. Despite the large number of boats in the anchorage, all were well behaved and a quiet night was enjoyed by everyone. Saturday & Sunday July 22/23, 2017: A gusty north wind greeted us early this morning, prompting us to move to another of Valcour Island’s anchorages for more protection from the wind and waves. This time, we moved to the west side of the island, just south of Bluff Point. This was a much larger anchorage and we were pleased to find another 37’ Nordic Tug named Calypso. Mid morning we lowered our dinghy and went over to introduce ourselves to owners Jeff and Linda from Plattsburgh, New York. They are new owners and had lots of questions about what changes and upgrades we’d done, so we had them over to see Tug’n later in the day. Afterwards, we went to visit with Bob and Jan. Bob had just lowered his dinghy and was planning to take it for a run, as he'd had it in the lake since we’d left the salt water. Also, he’d not had a chance to give his brand new dinghy a fast run, up on a plane, so we volunteered to take some photos of him. After a short run, Bob stopped to adjust the trim of the motor. Moment’s later, we were surrounded by five local Sheriff’s deputies on two Sea Doos and one Boston Whaler with their blue and red lights flashing. One officer pointed to our dinghy noting “yours appears registered ok”. Then he looked at Bob’s dinghy and asked for registration papers. Bob carefully explained it was a new dinghy and despite his best efforts and those of the Zodiac dealer he bought it from, they were unable to register the dinghy in the State of Michigan until Bob and Jan got home. Well, that wasn’t good enough for the Sheriff’s men from the good State of New York. They wanted to see Bob’s identification and escorted him back to Wings. As Bob climbed aboard Wings, he said to Jan under his breath, “I’m in trouble”. Half an hour later, five officers of the law said their good bye’s leaving Bob with a ticket for $250, explaining that this was a serious matter of safety and they gave him strict instructions not to use the dinghy until it had been properly registered. While clearly a warning would have done the job, at dusk, the real safety issues occurred with several boaters on Sea Doos (no doubt the riders were fuelled by alcohol), tore in and out of the anchorage at speeds exceeding 50 miles per hour. By this time, there were over 100 boats in the anchorage, but unfortunately, there were no Sheriffs men in sight. We dutifully emailed Bob and Jan copies of the three photos we managed to take of Bob on a plane in his new dinghy. Those were very expensive photos! In the afternoon, we went ashore to hike one of the trails to visit Bluff Point Lighthouse. It was clear we took a wrong turn heading to the lighthouse as our route had some very rugged ups and downs. A young family at the lighthouse pointed us in the right direction to take the shorter and more leisurely route back to our bay. 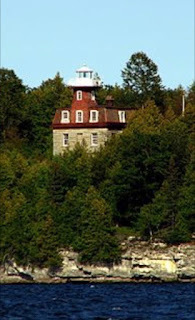 The Bluff Point Lighthouse was built in 1874 and was in service until 1930. From 1876 to 1881 it was manned by Civil War Veteran Major William Herwerth, who died on the job. His wife Mary was given command of the lighthouse which she maintained until 1902. 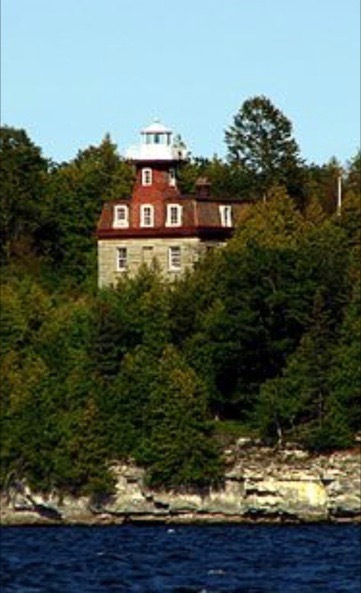 When the lighthouse went out of service in 1930, it was bought by a dentist who used it as a summer residence. Later, it became part of the Adirondack State Park. The Clinton County Historical Association restored the lighthouse and it is now open on Sundays in the summer for tours. We stayed another full day at the anchorage and completed a few more chores including some more stainless steel work as well as changing the main engine sacrificial anodes from zinc (used in salt water) to magnesium (for use in fresh water). Your engine, shaft, propellor, rudder etc are vulnerable to galvanic corrosion from contact with the water. Sacrificial anodes are designed to corrode first, before the more noble metals on your boat. Different anodes are required for salt water, vs brackish and fresh water. As you can see from the photo, our zinc anodes did their job well and were just about past their “best before date”. It was another lovely day on Lake Champlain with a mostly sunny day. Activities included another swim, a visit to a nearby marina to buy a bag of ice, another game of Cross-Crib where Bob and I lost to Jan and Fran for the third straight time and much entertainment watching boats come and go in this busy, beautiful anchorage. Monday July 24, 2017: It is a cloudy day with all day rain forecast. We are nearing the end of our stay on Lake Champlain as we gradually move further north towards the Quebec boarder. The wind swung around to the south early this morning and is forecast to pick up to 20 knots so a move was imperative. We chose Nichols Point at South Hero Island, a distance of just under 10 nautical miles. While underway, the rain got heavier, the wind got stronger, the waves got bigger and the temperature dropped. It’s been more than a month of hot summer weather and today we are now back in long pants, having hot tea instead of iced tea. We quickly got the anchor down and then hibernated in the cabin, reading, cooking, writing and planning the next stage of our trip with the upcoming boarder crossing, the Richelieu River and Chambly Canal. Each boat does their homework and then we confer with Wings and make our cruising decisions. Both boat crews are very agreeable and these decisions usually take only a short while. It continued to rain off and on all night and the temperature got down to 14 degrees C (a duvet night). Tuesday July 25, 2017: We woke up to a cool morning, but the rain seems to have stopped. We decided to try one more anchorage on Lake Champlain before heading into the Richelieu River tomorrow. Pelots Bay was just under 7 miles away. While fairly non-descript, it is well protected. Interestingly, the trees on one side of the bay appear to be turning colour already - this is way, way too soon. No plans. Nowhere to be. Just a relaxing day. Great title for this entry, Bob and the Sheriff's Men. I'm glad you're feeling guilty if only momentarily for all those who are not having such golden weather. Ontario seems to have got the worst effects of climate change these days. How many consecutive cool wet summers does this make? Thanks so much for your note Les. Regarding wet summers, my memory is short. But whenever we look back at the pictures, most of the time we always wearing shorts.